Discovery images of NEA 2014 JG55, a 10- to 26-foot-wide rock that passed only 1/4 as far as the moon from Earth on May 10, 2014. In the two hours separating these images, the object's apparent motion (indicated by the streak it forms on the images during the exposure) increased by 50% to 1.5 degrees per hour, and it brightened from 18th to 17th visual magnitude. 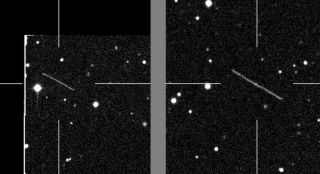 A small asteroid buzzed Earth Saturday (May 10), coming well within the orbit of the moon. The near-Earth asteroid 2014 JG55 missed our planet by just 60,000 miles (96,560 kilometers), or about one-quarter of the distance between Earth and the moon. The flyby marked the third-closest asteroid near miss of 2014, researchers said. The space rock was traveling about 22,000 mph (35,400 km/h) relative to Earth when it zipped past, they added. The asteroid likely wouldn't have done much damage if it had struck Earth, however; it's too small. Scientists think 2014 JG55 — which was discovered on Saturday by the Palomar Transient Factory survey in southern California — is 10 to 26 feet (3 to 8 meters) wide. That's about the same size as asteroid 2014 AA, the first new space rock discovered in 2014. The car-size 2014 AA was spotted on Jan. 1 and is thought to have crashed into Earth's atmosphere over the Atlantic Ocean just a few hours later. About one billion asteroids the size of 2014 AA and 2014 JG55 cruise through Earth's neighborhood, researchers estimate. Just a tiny fraction of them have been detected to date. As of today (May 15), scientists have identified and catalogued about 10,950 near-Earth asteroids of all sizes. The good news is that pretty much all of the potential civilization-enders — asteroids bigger than 0.6 miles (1 km) across — have been found, and none of them appear to pose any threat to Earth in the near future. But many other space rocks capable of devastating large areas of the planet remain undetected, cruising unnamed through the depths of space. And asteroids don't have to be behemoths to cause damage here on the ground. The space rock that detonated without warning above the Russian city of Chelyabinsk last year, for example, was likely just 65 feet (20 m) or so wide. The shockwave from the Russian meteor explosion shattered thousands of windows and injured about 1,500 people.